Here is a story near and dear to my heart. 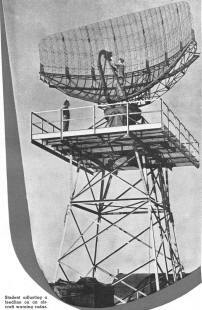 From 1978 through 1982, I trained for and worked on a ground-based, mobile air traffic control radar system (AFSC 303x1). 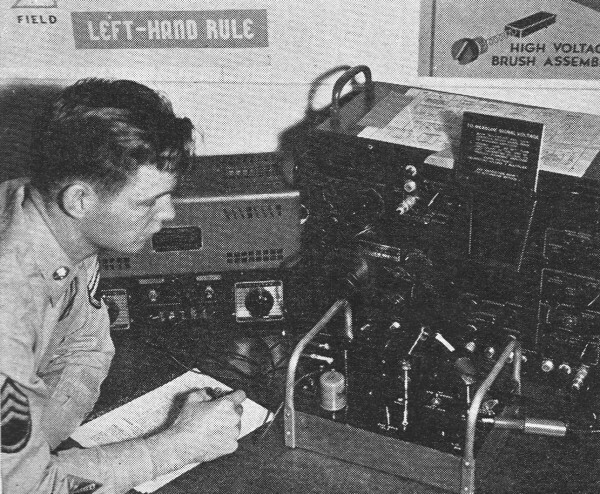 The AN/MPN-13 & 14 systems had both airport surveillance(ASR) and precision approach (PAR) primary radars, identification friend or foe (IFF) secondary radar, and UHF and VHF communications radios. 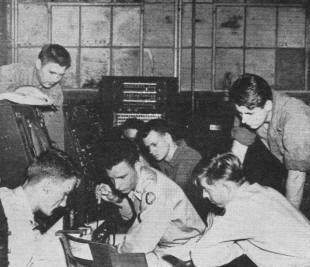 The AN/MPN-13 was contained in two trailers; air traffic controllers sat and worked within the operations ('ops') trailer where the radar electronics were located. It was very a cramped environment, particularly when maintenance was required. 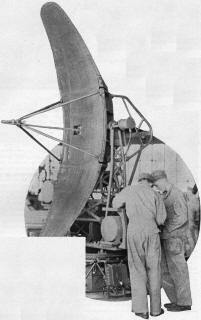 The AN/MPN-14 was basically an AN/MPN-13 with an additional separate, spacious, radar approach control (RAPCON) trailer. Controllers worked there in an uncluttered space, removed from the primary electronics. Of course the radar displays and radio controls were in the RAPCON, but they, havening mostly solid state circuitry, rarely needed service. The vacuum tube-based radars needed a lot of service, but worked amazingly well when everything was functioning properly. Following six wonderful weeks of Basic Training at Lackland AFB, Texas, eight months of classroom training commenced at Keesler AFB in Mississippi - where this story in Radio & Television News magazine takes place. I arrived in January of 1979, nearly 30 years after the fact. This was one of the most extensive training sequences in the military's arsenal; I think cryptography training was the longest at the time. Our training consisted first of a 6-week Basic Electronics course, designed for those who had no or very little experience with electronics regardless of which specific field of electronics was being pursued. It began with Ohm's law and resistor color codes and ended with designing and building astable multivibrators using transistors and LEDs. Fortunately, I was able to test out of the entire block with three full days of written tests, lab work, and interviews. Unfortunately, because the USAF managed to screw up my paperwork, I ended up waxing hall floors in the middle of the night for four weeks before finally beginning 'sets.' 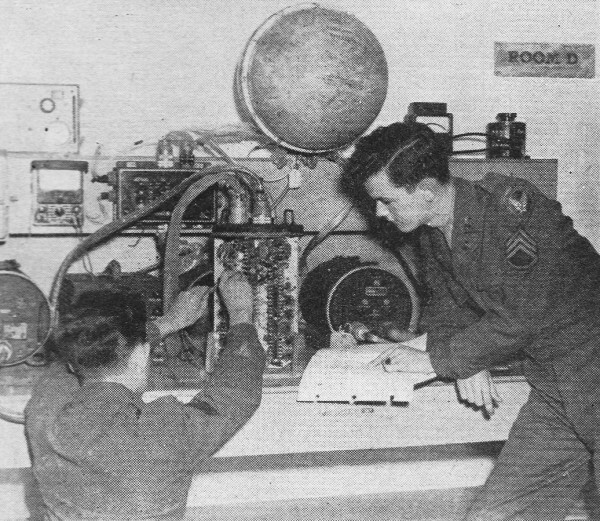 That is what the main radar course curriculum was called because syllabi were broken into subsystems like radar theory, transmitters, receivers, antennas, communications radios, power supplies, troubleshooting & alignment, etc. I do not recognize any equipment in the photos, and anyone shown here retired long before I arrived. Student adjusting a feedline on an aircraft warning radar. 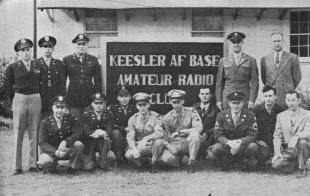 Typical club meeting of the Keesler Air Force base amateur radio club. 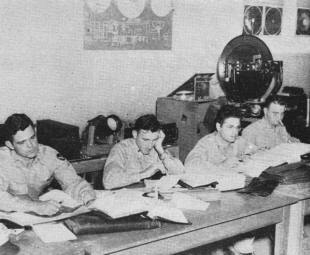 Front row (left to right): 1st Lt. Paul W. Ridenour; Major Charles E. Spitz, W7JHS; 1st Lt. James S. Mays. W5PDS; S/Sgt. Lawrence K. Hulett; S/Sgt.Gilbert Becklin; Capt. James B. Sanders, W5LKI; T/Sgt. Marion T. Atkins; Sgt. Robert J. Townsend, Jr.; Mr. Ancil Z. Arseneau, W50PR. Rear row (left to right): Capt. B. E. Tillotson, W5PDW; 2nd Lt. Arvid E. Hamer. W4KJI; 1st Lt. N. B. Ostrye, W5PDV; WOJG, R. A. Champagne, W4KQW; Lt. Col. Francis R. Delaney. Fig. 1. Most radars consist basically of the following units: power supply, synchronizer, transmitter, antenna system, receiver, indicator, and control panel. Block diagram shows the usual relationship of these units to each other. Students are taught inspection and repair. It takes a lot of men to man these equipments, and for the interested radioman or layman, here are horizons unlimited. Radar training starts with fundamentals. It includes six solid hours of theory. Complete laboratory training is included. Students perform experiments on circuits studied. What makes the multivibrator tick? Students perform projects in Servo mechanisms. Complete radar training - from basic principles to actual working experience - is covered at the Keesler Air Force Base in Biloxi. The Mississippi Gulf Coast, long famous for its shrimp, "place of worship" for the followers of Izaak Walton; and general vacation land for people who like to bask in its sunny breezes, is the site of one of the Air Force's large technical schools. 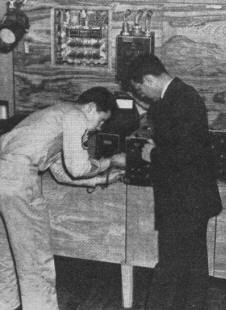 Keesler Air Force Base, one of the finest of the Air Force Training Command Installations, is also the home of Radar Training. One of the bright spots of the ARRL Delta Division Convention, held at Biloxi, Mississippi, on September 19 to 21, was the tour of the Radar Department with its whirling antennas, crackling sparks, and flashing oscilloscopes. 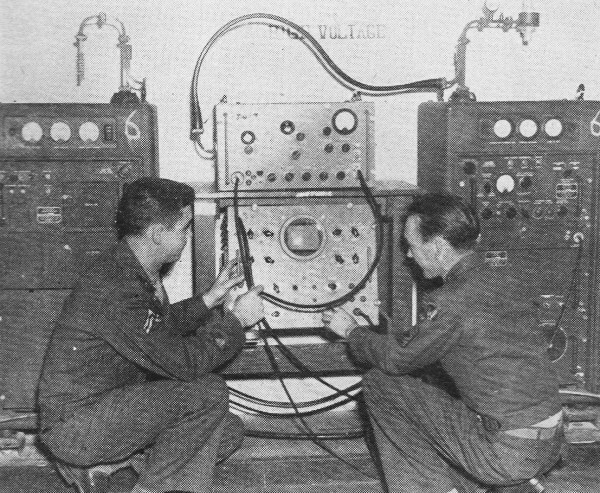 Radar, of course, is no longer one of the dark secrets of the past and much has been published on the subject; however, radar does exemplify some phases of radio at its peak efficiency, and every radioman who has had radar training has found his radio knowledge vastly strengthened. Radar antennas are of extremely high gain (and rotary, of course, as in the best amateur technique), receivers have such high gain and so low a signal-to-noise ratio that even some of the tubes used were bound to be adopted by the radio fraternity, where they now grace converters and pre-selectors in ham shacks throughout the country as the "hot" 6AK5 and 6J6, and QRM-less frequencies so high as to be barely tapped by communications people. It might easily be said that the commonplace in radar today is a view of the future in communications. Radar training starts with fundamentals, way back at the beginning, both for men who can't hook up a doorbell and "oldtimers" alike. For the latter, it is a highly desirable refresher about many things long since forgotten, or skipped. For the beginner, it represents an introduction into the mysteries of electricity and an electronics career in the bud. The pace is fast, with six solid hours a day packed chock full of theory and lab; the general theme is to learn by doing, but you must understand what you do. The course for a general airborne or ground radar mechanic is 42 weeks. Various specialist courses take different periods of time, depending on the scope and complexity of the work. The study of d.c. with the necessary accompanying mathematics starts the ball rolling. If you can assimilate the material contained in a text such as Cooke's "Mathematics for Electricians and Radiomen," you shouldn't have much difficulty. The student studies electrostatics, electrodynamics, and the circuit analysis of multiple generator and network circuits, magnetic induction, motors, generators and electrical measuring instruments which in turn are mastered before continuing to alternating current and its behavior in all types of reactive circuits. Intensive lab work is done where the student works projects in alternating current circuit analysis, resonance, and transformers. Particular emphasis is placed on vector analysis of alternating current networks and factors affecting magnitude and phase of circuit currents. It gets even more interesting as you go along, for at this point electronics begins. Electronic emission, vacuum tube construction, characteristics of gas and cathode-ray tubes are studied concurrently with all types of rectifier power supplies and regulators. 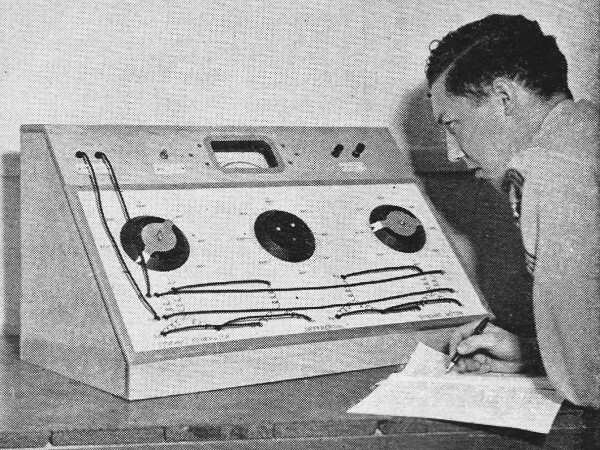 Enough equipment is provided so that each student performs experiments on each circuit studied, working independently of his classmates during the laboratory sessions. Amplifiers and oscillators come in for their share of scrutiny as do transients and non-sinusoidal alternating currents. 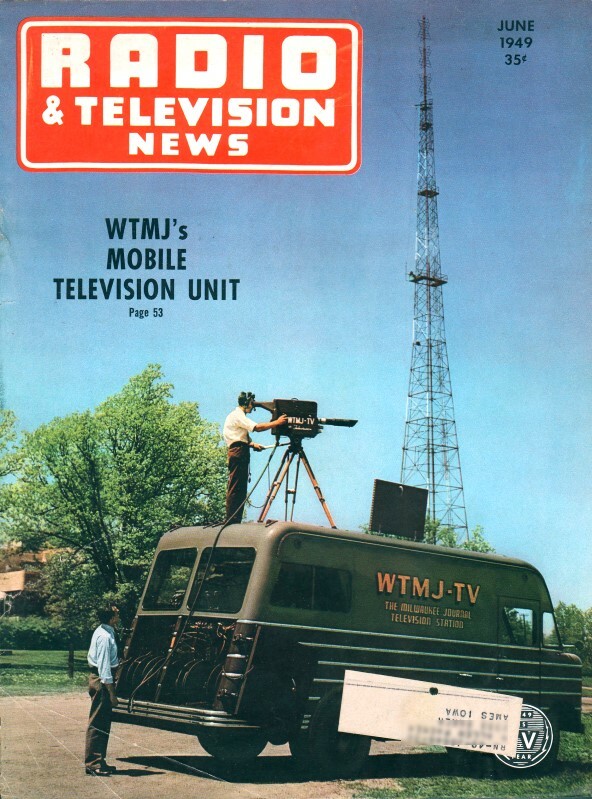 Limiters, clampers, and sweep generators, common terms to the television people, are also subjects for study. One of the more interesting student experiments in this phase is the determination of the effect of coupling, staggered tuning, and loading of i.f. amplifiers. Laboratory exercises include tracing one- and two-stage amplifier and oscillator circuits and determining the effect of variable factors on gain, bandpass, frequency stability, etc. Using Thevinin's theorem, amplifiers are studied quantitatively by breaking down their complicated mass to equivalent circuits, which makes for ease of understanding and learning. By now the student feels as though he has mastered a good deal, and he surely has. An oscilloscope is constructed by each student, and he completes this phase of training with fur­ther oscilloscope analysis, servo mechanisms and electronic timers. In the conclusion of electronic fundamentals, the principles of AM and FM modulation are studied, together with generation; transmission and propagation of microwave energy, impedance matching, how to convey the energy to the antenna by means of various transmission lines, and how to radiate it by various forms of antennas in order to produce desired directive patterns. Six months of intensive work have gone into the making of our future radar man in order to ground him well in basic concepts, and both he and the Air Force have reason to be proud of his accomplishments so far. In order to apply this knowledge, whole sets and systems are studied and operated, and trouble shooting is practiced for periods of eight to sixteen weeks. The sets studied range from small, compact, relatively simple systems, to bulky and complex blind landing and aircraft warning equipment weighing tons and numbering literally hundreds of operating tubes and circuits. The student is taught to calibrate, tune, adjust, inspect, and repair each set he is studying. The main objective is to understand the principles of electronics underlying the various circuit combinations peculiar to each set, enabling it to do the job for which it was designed. Many different types of equipments are incorporated into the courses, and the student soon learns that specialized uses require specialized sets. Therefore, with a maximum of practical work, equipments taught are representative of those used for altimeters, bombardment, gun-laying, navigation, weather observation, search, height finding, blind landing, and air traffic control. A typical section of the course deals with a simple radar system, such as a high-altitude altimeter, and by means of it, introduces the student to the kind of maintenance work he would be expected to do. This includes training on the sort of tools he will have to work with, such as test equipments, hand tools, and technical manuals. 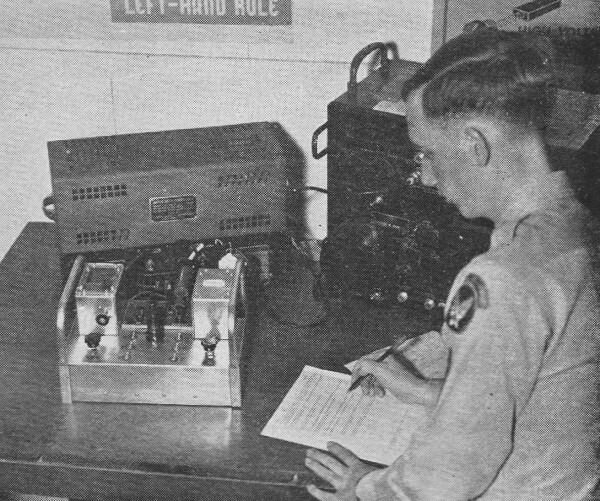 He also learns the basic circuits necessarily incorporated into a simple functional radar. Stress is placed on how these circuits are oriented with respect to each other, and the specific way these circuits are used to enable them to do the job for which they are intended. Most radars consist basically of the units found in the first one studied. Typically, these are the power supply, synchronizer, transmitter, antenna system, receiver, indicator and control panel. The usual relationship of these units to each other is best shown by a simple block diagram such as the one in Fig. 1, with the indicator arrows radiating from each source. Some equipments are similar to FM radio, but because of their use, for example, a typical low-altitude altimeter, they are treated as radar. The set studied has widespread popularity, and does its job of measuring height above the ground so efficiently, it is used in a great many types of aircraft and by most airlines. One typical radar studied may seem rather large for airborne equipment, being a little more than a quarter of a ton, and consisting of no less than nineteen units connected by seven miles of wire! Other courses deal with aircraft warning radar. These giants, delicate though they be, indicate the movement of aircraft, telling of speed, direction and height, and some are so large they even have their own telephone system. 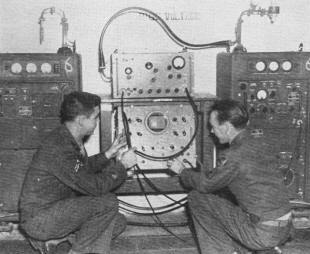 It takes a lot of men to handle these equipments, and for the interested radioman or layman, here are horizons unlimited; new circuits, techniques, and methods that stir the imagination. Here truly are careers awaiting men. Recreation. facilities are plentiful, and the average radio man or amateur is interested in the Keesler Air Force Base Radio Club, co-sponsor of the Delta Division 1948 ARRL Convention. Enthusiasm in the club mounts high. The clubhouse is a pretty white cottage, with two 600-watt transmitters, a four-element rotary on 10 meters, and fixed antennas on other bands. 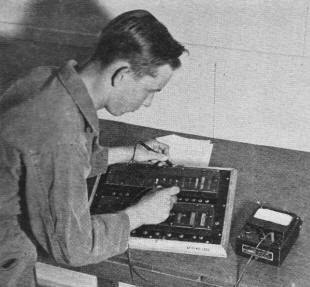 Many of the students and school faculty have their own rigs operating in barracks or quarters, and their calls are known throughout the world, wherever there are amateurs. Many graduates leave to become well known DX stations, and it is not unusual to have D4, KG, and J hams arrive as students or instructors, both military and civilian. We like it here, know that you would, too, and hope some day to have the pleasure of welcoming you as one of us! Even small, compact, and simple systems are tried. Students are taught to tune, calibrate, and adjust.